Fort Worth & Tarrant County explores the past and present of "Cowtown" and its neighboring cities. The county's major city, Fort Worth, has been likened to a young hellion who has matured into an unwonted respectability. When other frontier towns dried into dust, Fort Worth dug in and survived. In three generations, the remote army post on the Trinity River grew into a major city, its growth paralleling major phases and developments in the American West. And with Fort Worth, Tarrant County grew and prospered, their identities linked by geography and commerce. Cattle, railroads, oil, aviation--these form the rich tradition of Tarrant County history, a history preserved in the many landmark structures that survive today and serve to introduce resident and visitor alike to the past. There's the Livestock Exchange Building that symbolizes Fort Worth's history as Cowtown--it once held the offices of forty-two livestock commission companies and livestock buyers. The Eddleman-McFarland House, Thistle Hill, and Arlington's graceful Fielder House recreate the days of cattle baron mansions and high society. The seven-story Flatiron Building downtown was one of the tallest buildings in North Texas when it was built in 1907. And the spirits of Hell's Half Acre, Fort Worth's notorious red-light district, still draw the attention of local residents and visitors alike. Fort Worth & Tarrant County introduces you to the places where Tarrant County history was made. Book in hand you can visit these sites and many more. The history of buildings and sites inevitably includes the people behind them, the people who created the history. In these pages you'll read about Al Hayne, who rescued people from the burning Spring Palace; or Amon Carter, who brought aviation to the city; W. T. Waggoner, the legendary cattleman who built Thistle Hill for his daughter and whose name graces an historic office building. Buildings in this guide are listed on the National Register of Historic Places, have a Texas Historical Marker, or a designation as a State Archeological Landmark. This easy-to-use guide is arranged geographically. Five sections describe sites in Fort Worth. Smaller cities are listed alphabetically within three general geographic areas. Cemeteries are in a category by themselves. Thematic tours are listed by subject or interest, such as African American history, historic neighborhoods, or the cattle and livestock industry. Illustrated maps guide explorers on suggested walking tours, and a timeline chronicles the county's history. 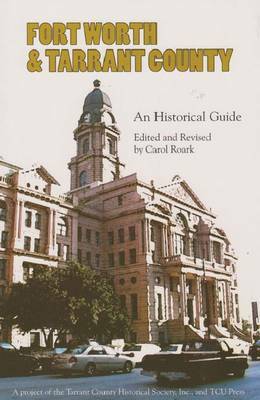 A project of the Tarrant County Historical Society and TCU Press. Publisher: Texas Christian University Press,U.S.